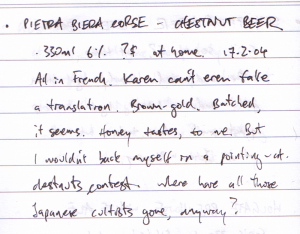 Verbatim: Pietra Biera Corse – Chestnut beer. 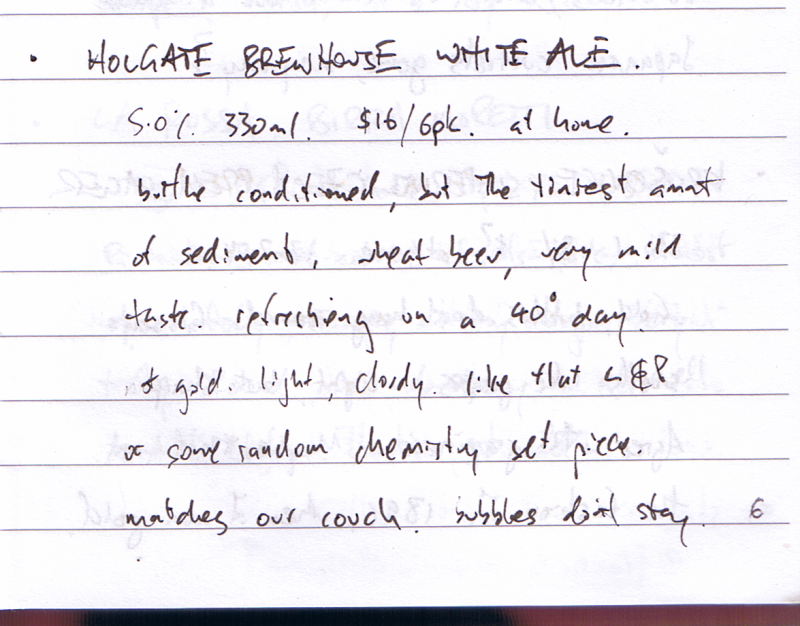 330ml, 6%, ?$, at home, 17/2/04. All in French. Karen can’t even fake a translation. Brown-gold. Batched, it seems. Honey tastes, to me. But I wouldn’t back myself in a pointing-at-chestnuts contest. Where have all those Japanese cultists gone, anyway? 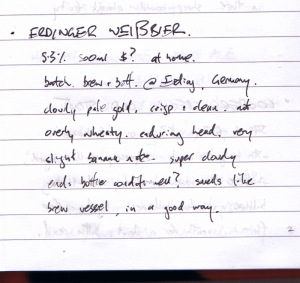 Afterthoughts, October 2010: It turns out that this is also a Vienna Lager, which accounts for the honeyish taste that I spotted. 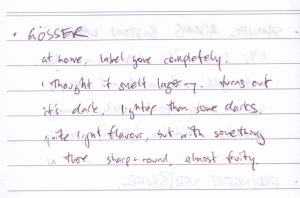 (Not crediting myself with the ability to discern the flavour, or even appearance, of chestnuts refers to the longstanding problem of my astounding level of ignorance about food.) The pondering about “Japanese cultists” comes from the fact that, for a while, Melbourne was peppered with strange roast-chestnut roadside-stall things, almost exclusively staffed by Japanese people, and seemingly doing no business. Then they disappeared as suddenly as they arrived. George and I figured they must’ve been some kind of well-disguised religion. 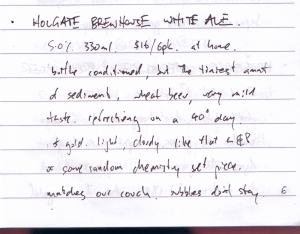 Verbatim: Holgate Brewhouse White Ale. 5.0%, 330ml, $16/6pk, at home. Bottle conditioned, but the tiniest amount of sediment. Wheat beer, very mild taste. Refreshing on a 40° day. Not gold, light, cloudy. Like flat L&P or some random chemistry set piece. Matches our couch. Bubbles don’t stay. Verbatim: Schöfferhofer Hefeweizen. 5.0%, 500ml, $?, at home. Bottle conditioned, cloudy light-brown gold. Enduring head. Light but sharp yeast smell. Sharp taste, but not at all John Williamsy. 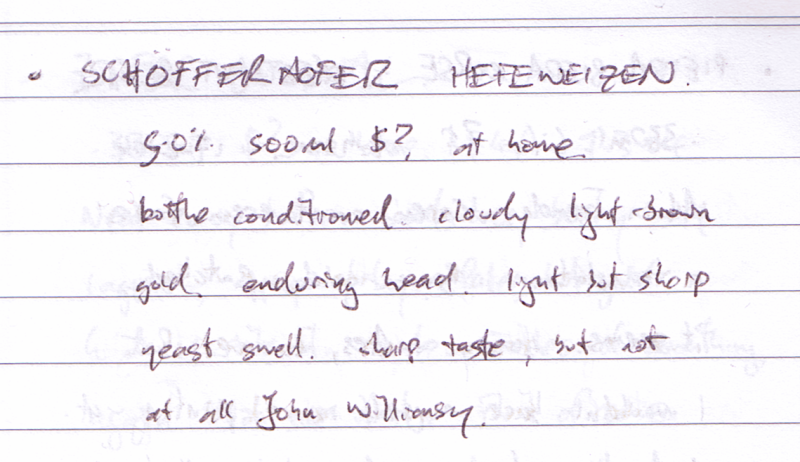 Afterthoughts, October 2010: I’m still a big fan of this Hefe, but here I’m most pleased to see the beginnings of my particular style of tasting note. By “John Williamsy”, I mean things that are big and brash, fleetingly impressive, but really rather obvious when you get down to it, and then increasingly annoying as you realise how overwrought it really is. I often complain that his film scores might as well be just his own voice, quitely burbling “tense little quiet scene, there’s tension and quietness, quietness…” or screaming “BIG DRAMATIC MOMENT, MMM-OOOH-MENT!”, as the script requires. In many ways, really, he’s the perfect partner for that hack George Lucas. Anyway. I don’t like that approach. And this beer doesn’t go there, bless it. 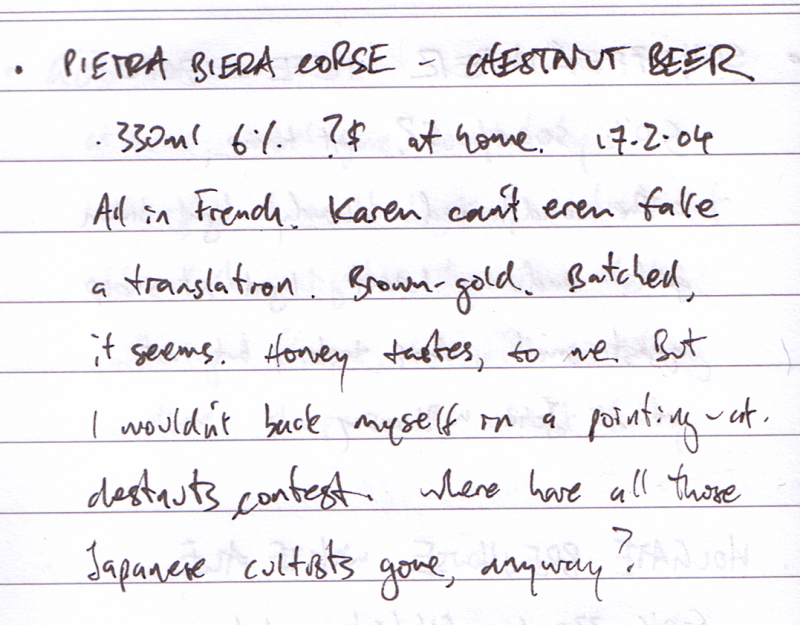 Four entries in, and we already find our first beer that no longer exists, as at the time of the Great Uploading in October 2010. I had to check online to make sure this actually did exist, and I wasn’t just drunkenly misrecording the regular Best Extra Stout. 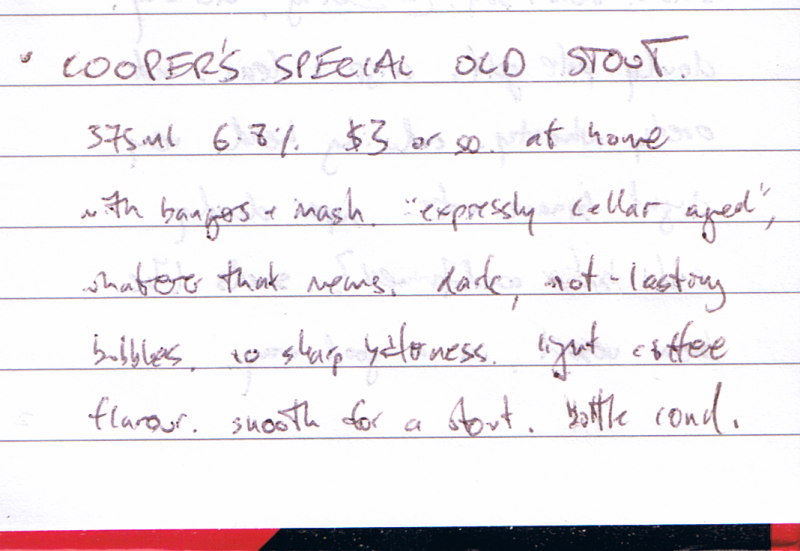 Verbatim: Cooper’s Special Old Stout. 375ml, 6.8%, $3 or so, at home with bangers and mash. 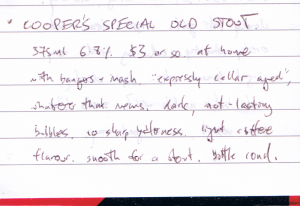 ”Expressly cellar aged”, whatever that means. Dark, not-lasting bubbles. No sharp bitterness. Light coffee flavour. Smooth for a stout. Bottle cond..
Afterthoughts, October 2010: The commercial description (online at RateBeer.com) calls this the “worlds first aged stout”. Which seems implausible. And again calls out the brewery’s strange relationship with the apostrophe. The family name is simply Cooper. I’ve met the latest heir-in-charge, Tim Cooper. But they seem determined to neither be Cooper’s Brewery nor even Coopers’ Brewery. It’s a bit strange. I have to guess at just which Gösser beer this is; I had left some of the beers in there and what was once ice was later a few inches of water, and the label floated right off of this one and turned to moosh. Verbatim: Gösser. At home. Label gone completely. 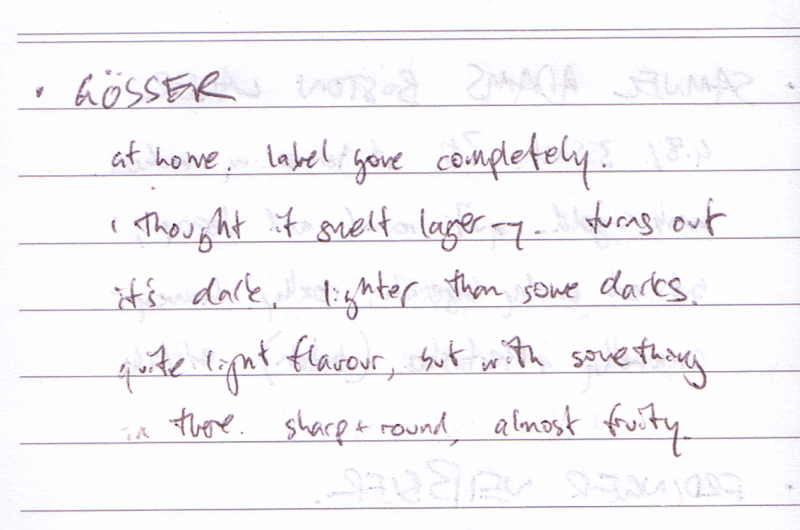 I thought it smelt lager-y, turns out it’s dark. Lighter than some darks. Quite light flavour, but with something in there. Sharp and round. Almost fruity. 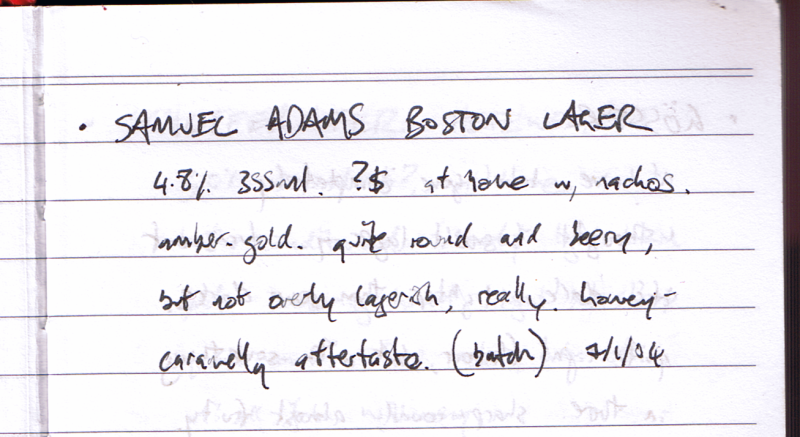 Afterthoughts, October 2010: So soon after the initial Sam Adams was I again undone by naively thinking that all and only lagers were golden. The path to Beer Nerdery is beset with wonderful re-jugglings of preconceptions like that. I’m also fairly sure that I’m right in saying that this was likely the ‘Stiftsbräu’ Dunkel — definitely matches colourwise, and it does have that slightly sweet note, according to people who actually knew what they were reviewing. That’s a terrible effort at one of those ‘ß’ characters in my handwriting. But hey, at least it’s not as hideous as my 5s. I can never figure out where they went wrong. Verbatim: Erdinger Weißbier. 5.3% 500ml $? At home. Batch. 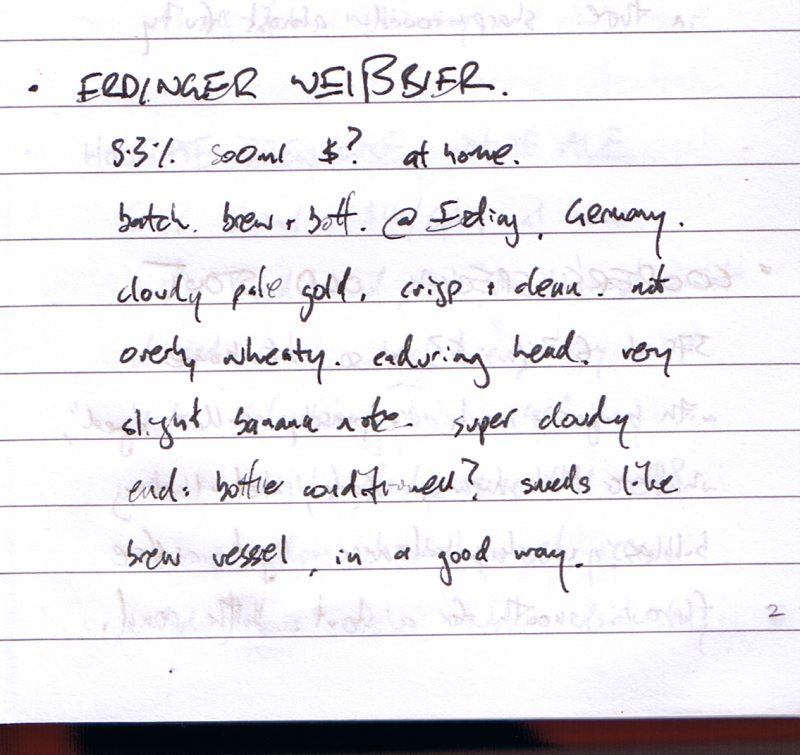 Brewed and bottled @ Erding, Germany. Cloudy pale gold. Crisp and clean. Not overly wheaty. Enduring head. Very slight banana note. Super bloudy end: bottle conditioned? Smells like a brew vessel, in a good way. Afterthoughts, October 2010: Again with the bottle-conditioning fixation, but rather embarrassingly not picking up that this one so obviously is. 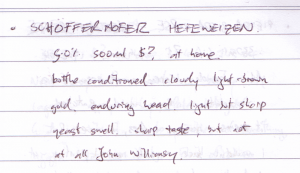 It’s hefe, after all. And I’m not quite sure what I was mentally comparing-against when I said it wasn’t ‘overly wheaty’ — possibly Tuatara Hefe, which is definitely moreso, and has more in the banana department. So to speak. 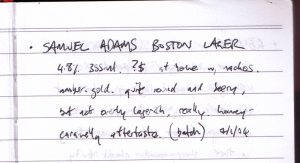 Verbatim: Samuel Adams Boston Lager. 4.8% 355ml ?$ at home w/ nachos. Amber-gold. Quite round and beery, but not overly lagerish, really. Honey-caramelly aftertaste. (Batch.) 7/1/04.